Guyana and the CARICOM Development Fund (CDF) on Saturday July 6 signed a country assistance programme agreement that will inject US$7.32M into Guyana’s agriculture sector. Guyana’s Finance Minister, Dr. Ashni Singh and Chief Executive Officer of the CDF, Ambassador Lorne McDonnough signed the agreement for a combination of a US$4.566M concessionary loan and a US$2.66M grant, at the Hilton Hotel. Donald Ramotar, President of Guyana, the Hon Carolyn Rodrigues-Birkett, Minister of Foreign Affairs, the Hon. Robeson Benn, Minister of Public Works, Transport and Hydraulics, and the Director-General of the Ministry of Foreign Affairs, Ambassador Elizabeth Harper, witnessed the signing. Through the funding, more than 9 000 farming households are to gain easier access to farmlands to improve and sustain agriculture production year-round. In brief remarks, President Ramotar said the funding made possible through the CDF would go a long way towards improving the infrastructural development in the agriculture sector which, in turn, would stimulate and develop production particularly in three regions of Guyana. 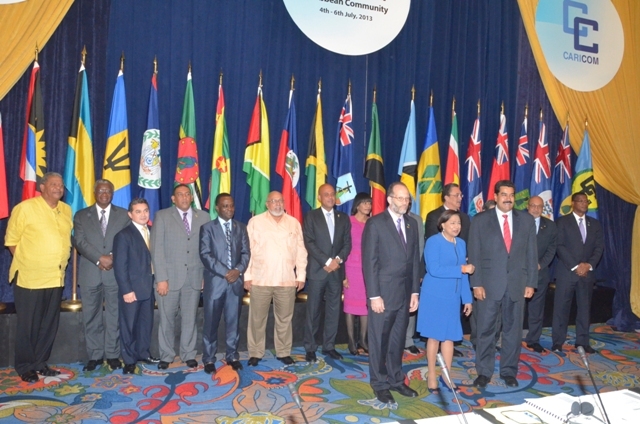 He pointed to Guyana’s capacity to feed the Caribbean and to contribute to the food security of the Region.